We take liberties, and we build from from many traditions. We make stuff up, and we make do. We celebrate this day with squirrely abandon, and hardly any sense of what real winter is. 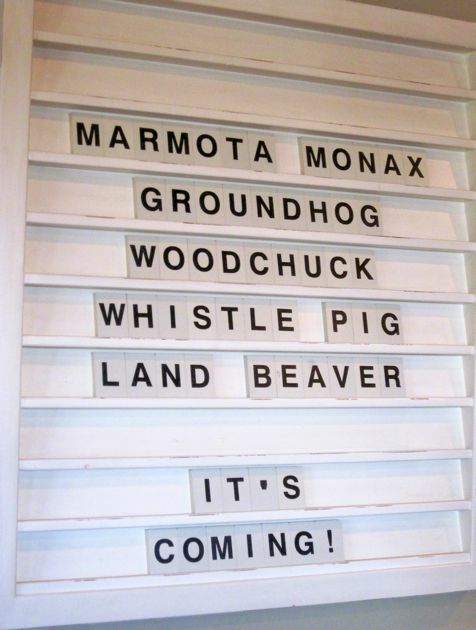 It is our Groundhog Festival of Frivolity and Spring Anticipation. It is possible that we will never have this holiday or our purpose clearly defined, or that it will ever make sense. But senseless measures, and whistle-pig whimsy go well together, I think. And so, we are happily preparing for Groundhog Day, and making something of nothing. Please, join us. What are you doing or thinking of, in anticipation of spring? We will be right there celebrating with you, we like making something of nothing. Somewhere I do have a groundhog cookie cutter, if you can believe such a thing! I see some groundhog gingerbread cookies in our very near future, an early morning check of the news to see what the land beaver down in Pennsylvania did or didn't see, and maybe some avgolemono soup which seems to magically bridge the passing from winter to spring. And of course the annual viewing of "Groundhog Day!"